Editing options are a little limited in Google Sheets. Until now, iPad and iPhone users have been poorly served by official apps for accessing their Google Drive-stored documents. Unlike its Android counterpart, Google Drive has always been a read-only option for viewing documents stored in the cloud, but all that has now changed. Google Sheets, along with its companion apps Google Docs and Google Slides (presentations), allows you to not just access files stored on your Google Drive account for viewing, sharing or printing, but also edit existing word processing documents and even create them from scratch. It even boasts built-in collaboration, allowing you to work on a document at the same time as a friend or colleague, and works with Microsoft Excel files as well as its own proprietary formats. Editing documents is a bit hit and miss – all the tools you need for editing and formatting cells, and tweaking formulas are all there, but you can forget about inserting, creating or even seeing in some cases any charts or images you create. The app is also able to work offline with your documents too - to do this, you’ll need to open the document as normal, then tap the menu button before ticking "Keep on device" to download a copy. Once downloaded, your documents are accessed via the main menu under – wait for it – the "On device" section. Google Sheets does some things brilliantly, but its crippling editing tools makes it feel like a half-finished product – it’s fine for editing sheet data on the go, but if you want to generate charts you’ll find its too limiting for everyday use. What's New in Version 1.2019.14204? 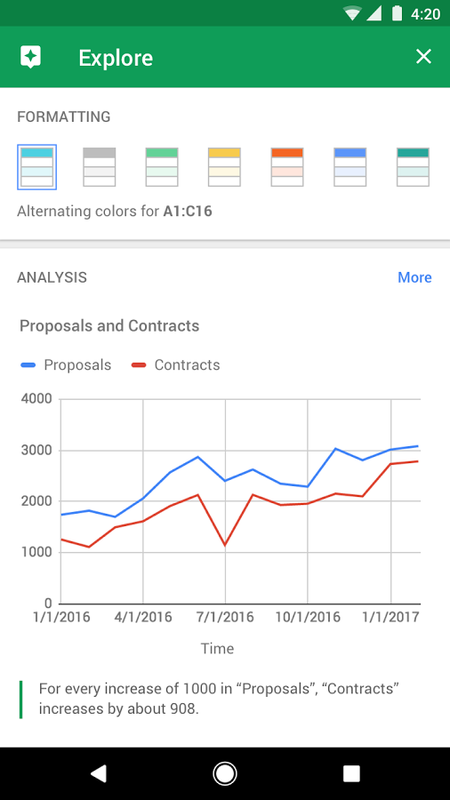 Limited editing options make the Google Sheets app less compelling than it might otherwise be. Something for a future version perhaps?